There's something about the Joker that inspires extreme reactions in fans. While I appreciate Heath Ledger's performance in The Dark Knight, can we stop talking about it like it was the greatest thing ever? And on the flip side, Jared Leto's gangsta take on the Clown Prince in Suicide Squad doesn't deserve nearly so much hate. 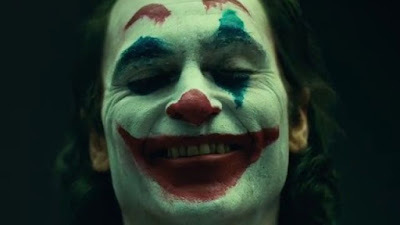 Now, I think we're going to get another very divisive response, this time to Joaquin Phoenix in Todd Phillips' Joker. After teasing us with a boring first image some days back, we now have the first look at Phoenix in full Joker makeup. And it's...well, kinda plain? Don't get me wrong, I wouldn't want to run into this clown in a dark alley but his appearance is far from shocking and not really comics accurate. That said, I should probably consider this is an origin story, and perhaps Arthur (as the character will be named as a civilian) hasn't perfected his look yet. The only thing that really matters is Phoenix's performance, and already I can tell this is going to be creepy as f**k. It's just a "camera test" but probably indicative of how Phoenix is going to look in the final version. What do you think? Joker hits theaters on October 4th 2019.